We all know that the character of gardens and outdoor space has changed dramatically in recent years, with gardens now seen as an extension of a property’s living space and a reflection of our lifestyles. We’re increasingly looking for more from our outdoor space: that’s why demand for outdoor hot tubs has increased rapidly in the past five years. 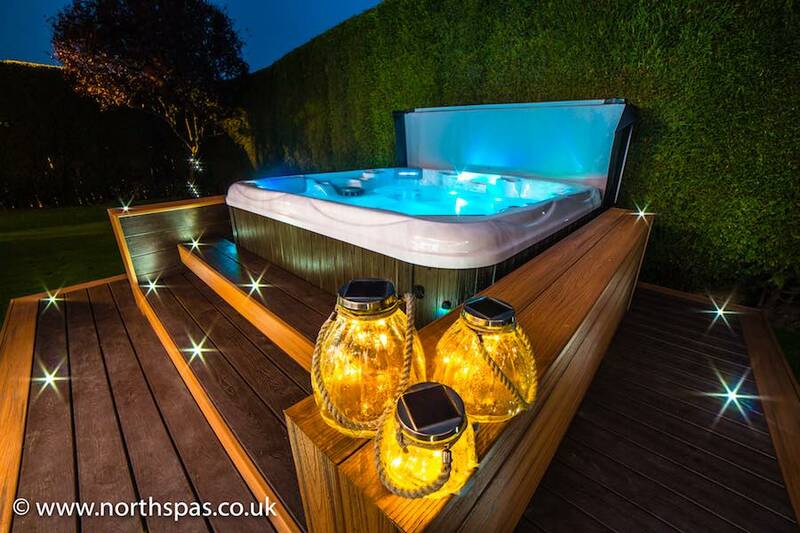 North Spas, the North East’s leading supplier of high quality hot tubs, explains how they use decking to create stunning garden landscapes with hot tubs as the centrepiece. 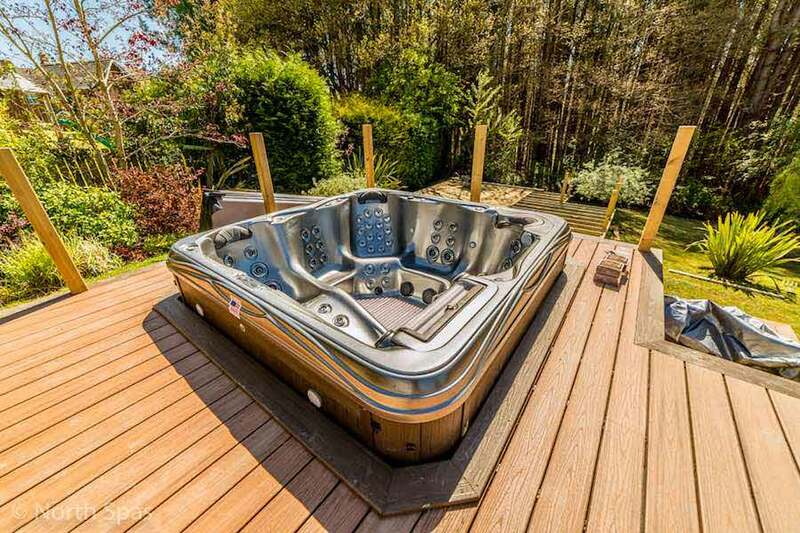 At North Spas, we started out in 2006 with a simple mission: bringing a real, high quality hot tub range to the north east of England, with excellent customer service and aftercare to match. We’re installers as well as suppliers, and we always aim to go the extra mile in helping our customers to transform their outdoor space. 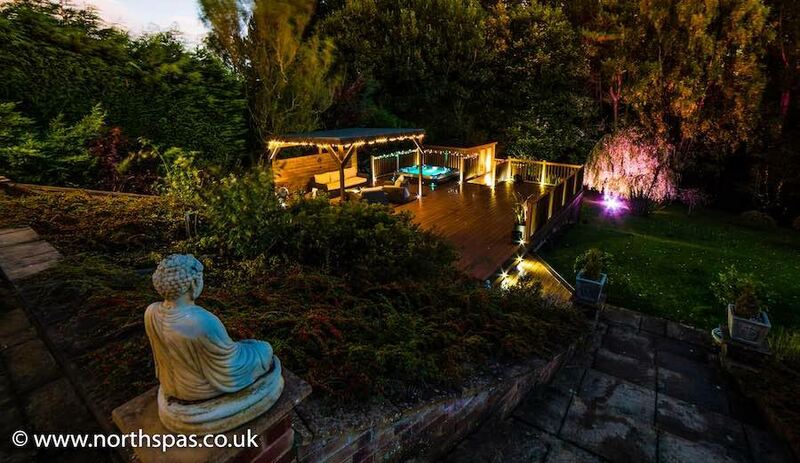 For example, where clients have the space, the use of decking adds an extra dimension to the design, with the hot tub acting as a focal point. We have been offering decking options to our clients from day one: back then it was always traditional timber decking, which clients took to thanks to its natural appearance and sustainability. But wherever you choose to position your hot tub, one simple fact holds true: the surrounding area will always get wet. And as part of our aftersales annual service, we noticed that where decks were not treated, significant changes had occurred due to the inevitable exposure to moisture. That’s when we began to look into composite options as a lasting solution. We used Trex composite decking for the first time in 2015 and it became an immediate hit. In fact, one of our first Trex projects – an Artesian 627M hot tub with a 92 sq m deck in Trex Transcend Island Mist (pictured above) – was named the UK’s Best Hot Tub Project of 2016 by the UK Pool and Spa Awards and BISHTA Awards. 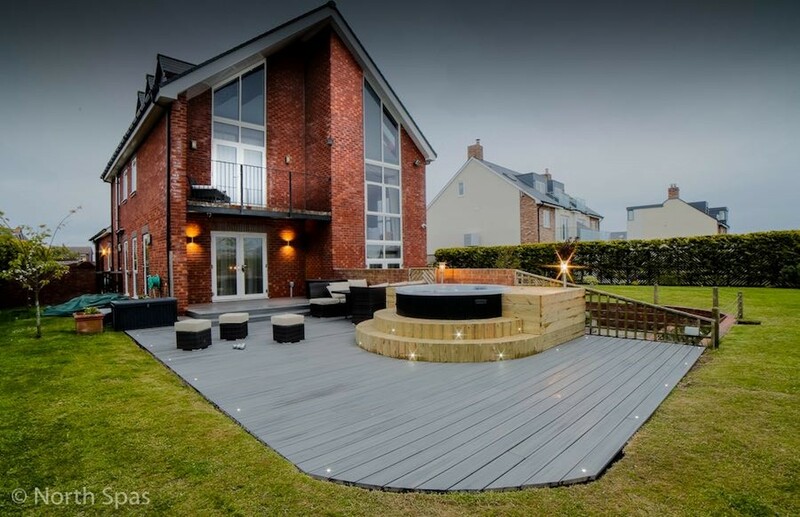 More importantly, our client was delighted with the project and loves their decking and hot tub area. Trex is a truly great product, and one that we recommend to our customers with total confidence. With its on-trend grey hues, Island Mist is proving to be our most-requested decking option. We’re proud to say that we’re now approved Trex installers having passed our on-site assessments, which means that anyone choosing a hot tub with decking can be confident that they’re getting the very best workmanship as well as an outstanding product. For us, Trex decking is the perfect complement to our high-quality hot tubs. As well as looking fantastic, Trex decking is non-slip and won’t warp or rot when exposed to moisture – so no matter how much people splash around, or how many times people walk across the decking with wet feet, it still stands the test of time. What’s more, we use the Trex hidden hideaway fastening system (pictured above) so there are no unsightly screws visible and our customers have a project that is finished flawlessly. Using decking also gives us the opportunity to incorporate design features into the hot tub such as ambient lighting. Hot tubs come with multi-colour LEDs built in, but we think it adds to the relaxing atmosphere and helps with safety to have complementary lighting on walkways and steps too. During our planning phase we include recommendations for the number of lights and where they should be positioned to create the biggest impact – and our in-house electricians will install the flush-mounted LEDs into the Trex boards to create a beautiful light-filled oasis. Whether it’s a detailed computer design or a quick sketch on scrap paper, you should incorporate the exact dimensions of your hot tub to help you calculate the correct height of the decking – it should not go higher than any cabinet lights, cabinet speakers or the shell of the hot tub. The joists of your decking frame need to be kept a few inches away from the hot tub cabinets so that your engineer can access the spa components. You can always fit a picture frame to the surrounding boards to disguise the gap – why not use a contrasting colour to add impact? 3. Make maintenance easier for yourself. The maintenance panel is usually located just beneath your control panel and is where you can perform routine maintenance such as water changes and services. 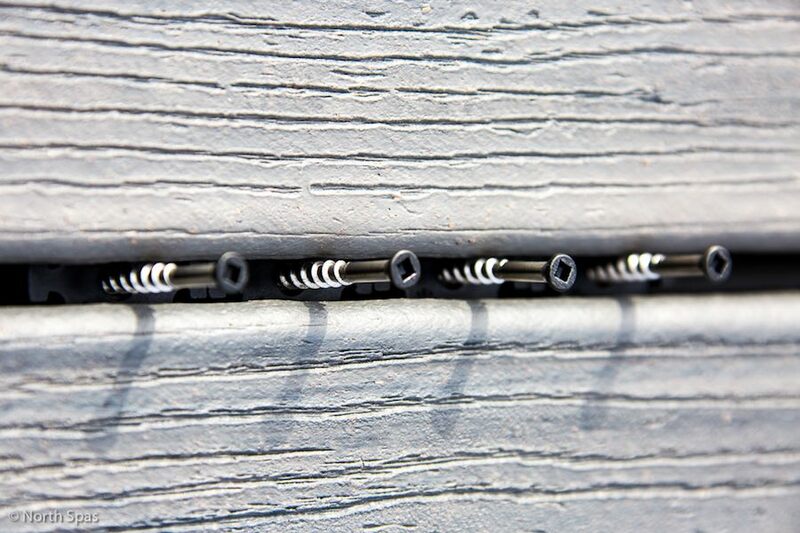 So before building your Trex surround, we recommend loosening the screws on the bottom of this panel to make performing these tasks a little less fiddly once your decking is complete.